On 23rd March 2016, WWE aired the 189th episode of NXT, having previously taped the event on 27th January 2016 at Full Sail University in Winter Park, Florida, USA. The show featured the #1 Contender to the WWE NXT Women's Championship Asuka facing off against Emma...but was it any good? Let's find out! This was the first time that I've ever seen anything in Elias Samson, as he worked a decent little match opposite EVOLVE Tag Team Champion Johnny Gargano. The moment that really made me sit up a take notice was Gargano attempting to come diving through the ropes back into the ring, only to be struck in the face with a big ol' knee from Samson. The spot was well timed by both men and came off looking great on TV. Whilst it seemed more like an element to progress the storyline than anything else, it was pretty cool to see Gargano come out with the victory and adds an element of unpredictability to the NXT product, with Gargano still to sign a full-time WWE contract. Samson impressed me even more after the bout as his destruction of made him look like a vicious beast. A feud with Apollo Crews, who came out to stop Samson's attack on Gargano, could do wonders for both performers who find themselves without places on Takeover: Dallas. Someone with a big place on the Takeover: Dallas card is NXT Champion Finn Balor who put on an impressive display against former Dragon Gate star, Rich Swann. Whilst taken on it's own merit the match wasn't anything all too special, as part of the build up to Takeover: Dallas it was an enjoyable piece of storytelling that allowed Balor to look every inch of the star that he is. This was a much more focused Balor to what we've seen before as he controlled the pace of the bout, in a similar way to what he did against Apollo Crews on NXT #182. The frills off the bout were left to Swann who pulled out a number of cool looking moves during a well-paced comeback sequence. I'm expecting to see a lot more of Swann in the second half of 2016. Balor looked comfortable in his victory, hitting a Coup de Grace and a Bloody Sunday to close the deal, as he continues to show just how ready he is for Takeover: Dallas in 9 days time. A simple piece of booking, but executed perfectly. I struggled to get into this one, because there didn't seem to be a whole lot of reason behind it. Alexa Bliss isn't on the Takeover: Dallas card, which is just 9 days away and isn't really in any storylines, so having he go over Indy performer Sarah Dobson (better known as Crazy Mary Dobson) in an extended squash felt a bit pointless. It didn't help proceedings that Sarah's only offence off the match, a diving crossbody, ended up looking horrible as she came off way too high, crashing her knee into Alexa's face. There was no real storyline progression for anyone, unless you count Blake and Murphy helping out Alexa to get the win, I suppose. Sparkle Splash closed things off in a run of the mill squash. One thing that majorly surprised me about this match was just how dead Full Sail University was for it. For me, they ended up sucking a lot of the energy out of the bout, as a lot of the crowd just didn't seem interested. Whenever Emma was in control they'd just go silent. They didn't seem to bothered in getting behind Asuka and I'm really not sure why. Maybe they were tired after a long taping? Maybe the bout was poorly placed within the taping schedule? I can't figure it out, because I know the exact same match got a great reaction inside the SSE Arena in December. Whatever it was it definitely effected my enjoyment of the bout as a home viewer. Luckily, the two women deliver a quality television main event and while I don't think it quite stands up to the level of their previous bout at Takeover: London, it was clear that this contest had a completely different aim. That aim being making Asuka look like a boss before her NXT Women's Championship match with Bayley in 9 days time. After some strong heel work from Emma and Dana Brooke to start things off, the bout really got going with a terrific back and forth strike sequence that built up and built up and built up. Whilst the bout was clearly designed as a showcase for Asuka, there was still a nice near fall thrown in their for Emma, who used a school boy roll-up with her feet on the ropes, where the referee almost counted three but saw the feet on the ropes and thought better of it. This lead to one of my favourite moments of the contest when Emma was arguing with the referee, whilst Asuka silently stalked her, with the moment being brilliantly captured by the camera team. Of course, the Empress of Tomorrow would eventually pick up the victory, as Emma tapped out to the Asuka Lock, ending her warm-up for Takeover: Dallas looking like a beast. Whilst this wasn't a "great" show in and of itself, it did feel like a show that will make the upcoming Takeover: Dallas a more satisfying watch. The main event delivered a rock solid television main event, that set up Asuka for her biggest match in the WWE in just 9 days time. 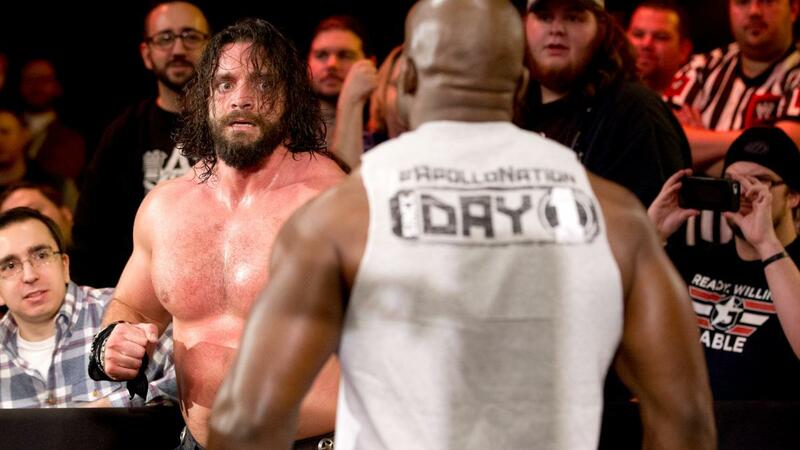 Finn Balor and Rich Swann's contest was the highlight of the undercard, whilst Elias Samson had his strongest performance to date with Johnny Gargano, before a new feud developed with Apollo Crews. It was a shame that Alexa Bliss' bout with Sarah Dobson felt a little bit needless and was pretty sloppy in it's execution, as it ended up letting down what was a cracking hour of television otherwise. With next week's show landing just 2 days before Takeover: Dallas, it'll be interesting to see what direction the show takes. Alex Riley vs. Apollo Crews and Samoa Joe vs. Bull Dempsey were announced this week and we'll have all the coverage heading into Takeover: Dallas in the same place next week, don't miss it.